Immunogen: Synthetic peptide corresponding to the sequence near the N-terminus of rat Ghrelin Receptor (GHS-R). Crossreactivity: Predicted species reactivity based on epitope sequence homology: human, mouse, marmoset, rhesus macaque, platypus, horse. Predicted MW of ~41kDa. Higher MW species (~75kDa) and intermediates also observed by Western blot which reflect post-translational modification and heterodimerization of the receptor. Scientific Background: Ghrelin is a multifunctional peptide hormone secreted from the anterior pituitary known to affect many physiological processes including the release of growth hormone, appetite regulation, gastric acid secretion, gastrointestinal motility, and blood pressure regulation. The 28 amino acid ghrelin peptide is modified at Ser3 by addition of a fatty acid group (i.e., n-octanoyl) that is essential for its biological activity. The ghrelin receptor (GHS-R) is a seven transmembrane (7-TM) GPCR that is expressed in the hippocampus, pituitary, and hypothalamus, as well as in peripheral tissues including the heart, lung, liver, kidney, pancreas, intestines, and immune cells. Ghrelin signals are primarily relayed via coupling of the GHS-R to Gq/11 alpha subunits, promoting stimulation of phospholipase C, and an increase in intracellular calcium. Stimulation of adenylyl cyclases and increased cAMP are also induced by GHS-R activation. In humans and swine, two splice variants of the ghrelin receptor are expressed from the same gene. The GHS-R 1(a) receptor is the 366 amino acid, 7-TM form, while GHS-R 1(b) is a 289 amino acid, 5-TM form that is truncated at the C-terminus and is pharmacologically inactive. The epitope recognized by this antibody is unaffected by alternative splicing. 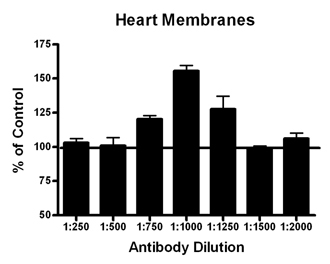 Membrane ELISA: Lewis rat heart membranes (5µg/well) were treated with 1 μM concentrations of agonist (Ghrelin) and probed with Ghrelin Receptor (GHS-R) pAb (1:250 to 1:2000 of a 1µg/μL stock solution) by ELISA. Data from vehicle treated cells were taken as 100%. Results are the mean ± SEM (n=4). Immunohistochemistry analysis: Human anterior pituitary, formalin-fixed, paraffin-embedded, and stained with Ghrelin Receptor (GHS-R) pAb at 40µg/ml. The image shows the localization of the antibody as the precipitated red signal, with a hematoxylin purple nuclear counterstain. Western blot analysis: MW marker (1) and 20µg rat heart extract (2) probed with Ghrelin Receptor (GHS-R) pAb 8.5µg/ml.